San Diego, CA –From the streets of New York City to the surf of the California coast, big things are happening to fuel biodiesel’s future. So it’s no surprise enthusiasts of America’s Advanced Biofuel were excited to converge this year in San Diego at the industry’s largest gathering of producers, distributors and fans. Throughout the week, attendees had an opportunity to learn more about the exciting developments for the biodiesel industry that have occurred in the past year. Sessions featured presentations from industry leaders such as NBB CEO Donnell Rehagen and NBB Chairman Kent Engelbrecht, and a keynote speech from former FBI hostage negotiator Chris Voss. The conference also featured an expo hall with exhibitors, student research posters, and a Biodiesel Vehicle Showcase with presentations from major OEMs such as GM, Ford, Nissan, and John Deere. Much of the discussion during the week centered on what the new Congress and Administration will mean for the biodiesel industry in general and the Renewable Fuel Standard specifically. This was the subject of one of the Spotlight Sessions featuring leading experts from Washington. To see pictures from the conference and listen to presentations, be sure to check out the conference blog. To watch NBB CEO Donnell Rehagen and NBB Chairman Kent Engelbrecht deliver the state of the industry address head over to the NBB YouTube page. Erie, PA –The largest biodiesel producer in the eastern U.S. is bringing a brand new concept to the biodiesel industry. Or, more accurately: a new brand concept. With production surpassing 60-million gallons annually between its two facilities in Pennsylvania and Alabama, HERO BX—a major supplier to wholesalers up and down the east coast—is now targeting Northeast heating oil retailers with a first-of-its-kind branded Bioheat program. HERO BX has already secured supply contracts with DF Richard Energy, based in Dover, N.H., and Estes Oil of York, Maine. As part of the supply agreement, HERO BX dealers will be provided marketing materials and support, including branded signage and truck decals, as well as online and social media promotion. But the more important benefit, says vice president of sales, Tim Keaveney, is fuel quality assurance. A BQ-9000-accreditted producer, the company’s Eerie plant is equipped with state-of-the-art technology from Desmet Ballestra, a global leader in biodiesel technology, and houses a certified commercial laboratory to ensure adherence to ASTM quality specifications. On its way to the Northeast, the fuel never leave’s the company’s hands, traveling on a HERO BX railcar to central Massachusetts, where it’s trucked to the company’s new 5000-barrel storage facility in North Hampton, NH. At the storage facility—the first of its kind in New Hampshire, according to Keaveney—distributors are able to choose biodiesel blends from B2 to B80 directly at their computerized rack, where they also have the option to either bottom or top load their truck. 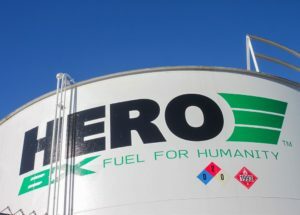 Keaveney says that HERO Bx’s “cradle to grave” fuel handling ensures quality control throughout the entire distribution chain—where fuel quality is most vulnerable to being compromised—while it also helps the company to control costs by using their own assets to transport, store, and blend the fuel. It also enables them to take advantage of the biodiesel tax credit no matter where it ends up landing on the supply chain. Already one of the nation’s largest biodiesel producers and wholesale suppliers, Keaveney says HERO Bx plans to grow their presence at the retail level by bringing this branded model to fuel distributors all over the country. For more information, visit www.lakeeriebiofuels.com. Portland, ME –Jarmin Kaltsas and Alex Pine are what you might call biodiesel do-it-yourselfers. Kaltsas hailing from Maine and Pine from southern California, their individual fascinations with biodiesel taking root on opposite sides of the country eventually brought their paths together. In 2004, while working in a greenhouse on a farm in rural Maine, Kaltsas began experimenting with turning small volumes of restaurant grease into motor fuel in his garage. Two years later, after securing enough funding and equipment for a commercial operation, he founded Maine Standard Biofuels (MSBF) in the restaurant-dense city of Portland. At around the same time, more than 3,000 miles away, Pine’s family (who ran their VW Bug on biodiesel) founded the Los Angeles Biodiesel Co-op, where Pine started working in middle school. When it was time to get his own car, the choice was easy—a 1987 Mercedes that he could run on biodiesel. After enrolling in the College of the Atlantic in Bar Harbor, Maine, he drove it all the way to the east coast, stockpiling biodiesel in portable containers along the way. Once in Maine, he became a regular customer of Kaltsas’s—then an intern, then a summer employee—until eventually, after graduating in 2014, he was hired fulltime by Kaltsas as his director of outreach and technology. Now in its eleventh year, MSBF employs more than a dozen people and produces roughly a half-million gallons of biodiesel per year. With three commercial grease collection trucks (plus a smaller truck for urban areas), they source grease from nearly 1,000 restaurants all over New England. They then process and sell biodiesel (primarily B20) as heating oil and on/off road fuel—with two delivery trucks and a retail filling station at their plant—while turning any unused grease into chainsaw oil, tiki torch fuel, and their popular line of “Wicked Strong” soap products. Along with some 400 residential heating oil customers, their fleet partners include Oakhurst Dairy, Casco Bay Lines, Atlantic Transport, Pine Tree Waste, Downeast Duck Adventures, Portland Trails, and Barber Foods, among others. MSBF’s first and longest customer, Oakhurst Dairy, has been with them from the very start, even providing a loan to help them get off the ground. 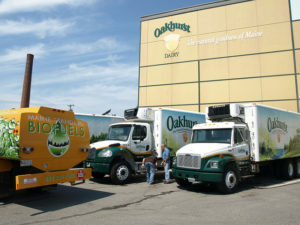 Oakhurst has a fleet of roughly 150 diesel vehicles, which have been running on a B30 blend for the past several years. They also use biodiesel in their refrigeration units. Green says he often fields questions from other companies who are thinking of moving to biodiesel, but express concerns about its operability during the cold Maine winters. Last year, Green visited with one of MSBF’s newest customers, the city of South Portland, which is currently conducting a year-long fleet study “to test the efficacy of the fuel in all conditions, including during the coldest months,” city officials stated. Since October, South Portland has been running a handful of city busses and public works vehicles on B20, tracking fuel consumption, performance, and monitoring engine componentry and filters for any issues. Though the study is ongoing, the city experienced several days of single-digit temps this past winter, reporting no issues related to the cold. If the program is successful, South Portland will incorporate biodiesel in the city’s entire 200-vehicle diesel fleet, representing one of MSBF’s largest customers to date. The how requires a bit more explanation. The first step is to assess whether your current infrastructure supports a biodiesel program. As B100 can be stored, pumped, and blended with equipment commonly found at many terminals today, some will be able to easily incorporate biodiesel with little or no modification. Others will have several infrastructural factors to consider for proper receipt, storage, blending, and transfer of the product. Once in storage, do not circulate your blended tank by way of air compressor and hose. Introducing oxygen into B100 or a biodiesel blend will oxidize the fuel and ultimately push it out of specification under EN 4112. Consider periodically gauging your bulk plant tank to be certain that the top, middle, and bottom have the same FAME percentage throughout. For outdoor storage and piping, mineral wool and fiberglass insulation with aluminum or stainless steel jacketing are the most common ways to prevent heat loss. Ceramic coating is another proven (and typically more cost-effective) form of insulation. It can be shop or field applied (similarly to paint) in most colors and with more or less thickness to achieve the desired R-value. To reduce heating and insulation needs altogether, B100 can also be blended in-line during offloading or blended upstream at a selected rate (B1-B99) and stored as a blended fuel. Regardless of “the how” of your operation, it is strongly advised that B100 originate from a BQ-9000 producer who has met the quality assurance guidelines and certification standards established by the National Biodiesel Accreditation Program. Although you may be purchasing a biodiesel product meeting or exceeding the Rancimat stability standard of 3 hours, it’s best that you source biodiesel rating between 7-10 hours. The higher the number the better your protection from fuel instability issues. Lastly, be sure to request from your supplier their most recent certificate of analysis on your biodiesel fuel. If you find that the date on your COA is not current, request from the supplier that an updated Rancimat be run on older fuels. For more information, including a list of biodiesel producers, visit www.biodiesel.org. New York, NY – The New York Oil Heating Association (NYOHA) is helping a teacher in Bronx, NY, incorporate clean-burning Bioheat® fuel as a teaching tool in an interdisciplinary approach to HVAC training. Peter Gonzalez is teaching the science of Bioheat® fuel – as well as math, chemistry and English – to 17 Bronx Design and Construction Academy juniors this fall, with NYOHA’s support. In addition to arranging for 150 gallons of pure B100 Bioheat® fuel and equipment to be donated by AMERIgreen Energy and Schildwachter Oil Company, Rocco Lacertosa, NYOHA’s CEO and a member of the school’s HVAC Advisory Board, recently visited the classroom to speak directly to the students. 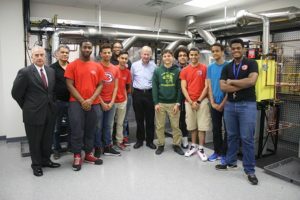 “We are very proud to support the excellent work that Peter Gonzalez is doing to help prepare New York City students for a future in the Bioheat® fuel industry,” said Lacertosa. Gonzalez has devised a curriculum of exploration in which his HVAC class learns through experimentation and reporting. The students are blending small quantities of heating oil and biodiesel and paying careful attention to the blend ratios. They burn various Bioheat® fuel blends up to 99 percent biodiesel in heating equipment and use combustion analysis tools to profile the emissions at each level. Experimenting with different blend levels is a timely exercise, as the New York City Council recently voted to raise the mandated biodiesel blend level in the City to 5 percent in 2016, and 20 percent by 2030. Gonzalez has recruited colleagues Jonathan Brown, Nathaniel Thayer Wight, Adam Ellias and Alrick Crowe to broaden the scope of the HVAC course to include mathematics, chemistry and English. Brown, a chemistry teacher, said he is helping the students evaluate the design of their experiments to ensure that they are generating valid results. Math is coming into play as the students learn to blend fuels in specific ratios and analyze the components of the combustion gases. The students are sharpening their English skills as they write reports about their experiments. Gonzalez increases the level of engagement by letting the students design their own experiments. Rather than tell them what blend ratios to use, he asks them to make those choices and report their results accurately. Fuel storage facilities should be sampling and analyzing their fuel three to four times a year— the start of spring being one of them. With the arrival of cool spring nights and warmer days, the alternating temps will conspire to create condensation within the tank, a leading cause of water contamination. a warm spring or summer day (68-86 degrees Fahrenheit), bacteria can double in population every 20 minutes, forming destructive, gel-like colonies known as biofilms. If not addressed, the proliferation of bugs will clog fuel filters, fuel lines and gauges; corrode pumps, injectors and tank bottoms; cause washers, hoses and connectors to swell and blister; degrade fuel, and cause poor fuel economy. If microbial contamination is detected— either by visual observation of a fuel filter or bottom sample, or by analytical laboratory testing—cleanup can be both difficult and expensive. In all cases, water bottoms should be drained and a biocide should be added to treat the remaining fuel. While in some instances it may only be necessary to filter the treated fuel, more severe cases will require physical removal of floating biofilm or bottom sludge. Depending on the severity of the problem, manual cleaning of the tank may be required before refueling to remove any remaining debris or corrosive byproduct from the interior surface. Good housekeeping is the best and most cost-effective preventative measure against water and microbial contamination. Please review the following housekeeping checklist to help minimize the potential for fuel quality issues. Drain water and sediment from tanks at least every six months. If all the water cannot be removed, drain as much as possible and treat the remaining in-tank water with a dual phase biocide and test for its effectiveness. Keep tanks near or at capacity to minimize condensation. Know the operability values of your fuel. Use additives judiciously and in accordance with the manufacturers recommendations; more is never better. Stick tanks with stick and paste. Check and drain water from water-fuel separators. Be certain all filters are OEM approved. Whether underground, above ground, or exposed in a basement, fuel storage tanks have kept millions of cars and trucks, as well as businesses, industries, aircraft, and homes adequately supplied with fuel. For as long as liquid fuels have needed some form of bulk storage, they have been filled with gasoline, diesel fuel, aviation fuel, biodiesel, ethanol, and home heating oil. Generally, the consumer rarely notices these tanks, nor does the consumer think about how their fuel could be impacted by factors such as quality and tank design. Over the past few years, a great deal of attention has been given to what appears to be an increase in premature filter plugging and corrosion activity in the underground storage tank (UST) systems across the country, which can affect every type of liquid fuel. To appreciate what could be happening to these fuel storage systems, we need to understand how the petroleum supply chain functions and how quality standards maintain fuel quality from the point of manufacture to the point of sale. It is interesting to contrast fuel quality management practices between the aviation industry and the pleasure-craft industry. In the case of the former, the airline industry worldwide has invested millions of dollars and hundreds of thousands of hours to develop a fuel management program that ensures that jet fuel maintains stringent fuel quality standards by filtering and dewatering at every step in the distribution network. From production, transport, and storage, to fueling the aircraft, industry practices ensure optimum fuel quality, resulting in reliable aircraft operation and, in turn, passenger safety during flight. In contrast to the aviation industry is the marine retail market, selling diesel fuel, gasoline, and E10. 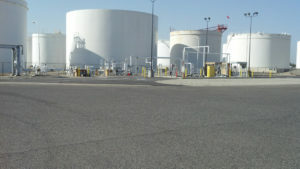 These fuel storage tanks are typically near a body of water, and subjected to temperature fluctuation and humid conditions. 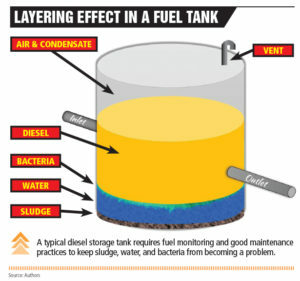 Over time, these factors result in the formation of sediment and bottom water that remains with the stored fuel until the tank is physically cleaned and dewatered. Let’s face the facts. Even if the fuel that you are buying and selling meets an ASTM specification, that specification represents “minimum” specifications. That does not automatically mean it’s a high-quality fuel, nor does it mean that the vessels that store that ASTM-specified fuel prior to consumption are clean and dry. 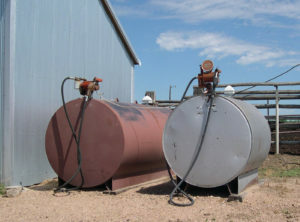 In the fast-paced world of liquid fuels marketing, in which I include biodiesel, one thing is certain: Sellers sell, buyers buy, but neither party frequently focuses on managing the storage tanks that store their purchases and sales. People often ask, why have petroleum terminals across the nation still not begun investing more in infrastructure to accommodate efficient and economical blending of biodiesel? 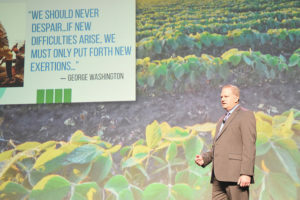 The simple answer centers around the continued uncertainty that looms over the biodiesel industry. Millions of gallons of liquid fuels will have changed hands during the time you read this article. The question is how many of those gallons passed through to consumption without enduring negative impacts of challenged storage tanks that contain water, sedimentation and degraded components of countless tank transfers? Adhering to ASTM standards and BQ-9000 fuel policies is a good start to minimize fuel performance consequences; however, it’s not enough. Those in the supply chain who move fuel or those who consume fuel need to adhere to strict tank management practices to preserve the quality criterion of the fuel and maximize their investment in each gallon of fuel consumed.